Macbeth goes Gorbals! But before all that we had a bit of a wait while they either a) go frozen on a pause in the Pinter rehearsal going on in the other studio, or b) they sent out search parties to local hostelries in search of cast members, or c) they cleared up after a bibulous corporate affair over-ran, or d) they fixed the blood cannon malfunction. My pal Neil Mendoza was ready and willing to step into the title role if called for. Luckily (or perhaps unluckily - we might have understood everything Macbeth had to say) he was not needed, although it transpired that the wait may have had something to do with McEvoy having had an accident which, while not quite unseaming him from nave to the chops, did mean he had to wear a plaster on his head and some protection around his thumb. The ridiculously youthful director came on beforehand to crave our indulgence if McEvoy's physical action - fighting - was not quite as violent as usual. Quite uncalled for. Shows have to go on. And frankly, we wouldn't have noticed any absence of laying on. McEvoy was tremendously gritty and Scottish and physical and I suppose this was meant to make him up-to-date and authentic. To be honest I rather liked his performance, even though I could hear very little of what he said. Either he was shouting or he was whispering and it was all in Gorbals. But, with all due respect to other recent high profile Macbeths, it was good to see one so emphatically heterosexual. 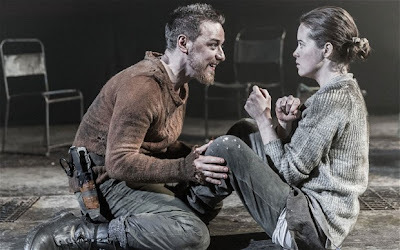 Claire Foy ("too young', "not scary enough" were criticisms) was excellent - scary and refreshingly young, and the sexual chemistry between M and Lady M was vivid, and I - though others don't agree - think it is essential that this work for the play to do its stuff. Some thought the stage too small for the size of the production. I must say that despite the shouty/whispery changes in volume tone and the lapses into Hugh "we're doomed" Laurie territory, and the terribly weedy Duncan and Malcolm (Kings? ), I thoroughly enjoyed this. MacDuff (Jamie Ballard) was excellent, but then he didn't have much of an accent. His "all my pretty chickens" speech reduced me to tears (but then almost anyone speaking it quite undoes me).